Surprise yourself with Ahu Vianpu archeological site with one of the larger Ahu on Rapa Nui. Passengers traveling to Easter Island have to pay an entrance fee of CLP 54.000 or USD 80.00 in order to visit the Archaeological Park.The entrance fee must be purchased upon arrival at Conaf Office inside Mataveri Airport and it's valid for the entire stay. Please note that it's not possible to buy this ticket in any other place and passengers will have to carry their ticket with them when taking our tours. Note for Cruise Passengers: Remember that this tour is only considered for passengers on Hotels, if you're coming on a cruise and you want to join, the service is called Shore-Excursion. Rapa Nui National Park, a wildlife sanctuary spread across most of Easter Island and a UNESCO World Heritage site, contains about 900 moai sculptures as well as 300 ahu, or ceremonial platforms, on which the carved figures stand. Sculpted from solidified volcanic ash, these statues are believed to represent the spirits of ancestors and high-ranking members of each tribe. After hotel pickup from Hanga Roa, travel south with your guide into the park to Ahu Tahai, a ceremonial platform that has a unique moai, a stone giant that stands alone, but which is protected by its more than 4 meters high and its imposing figure. Continue north to Puna Pau to see how some moai sport a different look. You'll notice they have pukao, or topknots made out of red scoria on their heads. It's believed the volcanic rock was used to impress rival tribes. Roughly 30 pukao are located in or near the Puna Pau quarry, the source of the red scoria. Then head to Ahu Akivi, where you’ll see a line of seven moai looking out toward the ocean. The moai here each stand 16 feet (5 meters) tall and weigh about 18 tons (16 metric tons). What's mysterious about these sea-facing figures? It's an unusual sight considering the other ahu moai stand with their backs against the water. 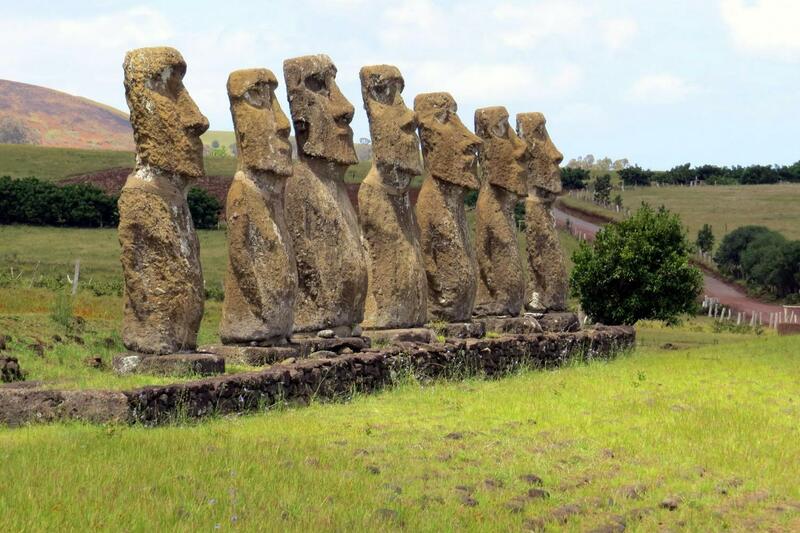 One theory behind their unusual position: These moai symbolize the seven explorers from the Polynesian homeland of Hiva sent by the chief to find the island of Rapa Nui. According to this hypothesis, these statues face the ocean in the direction they came from. Our last point will be The -Ahu Huri a Urenga- one of the 25 platforms that are not on the coast, but in the interior of the island and corresponds to an agricultural area, human settlements. After your engaging exploration of ahu moai, you’ll be taken back to your hotel.